I spent the last week in NYC on the advice of Playwright Foundation Artistic Director Amy Mueller. Since one of my goals is to gain more national exposure, she suggested I find agents I'm interested in working with so that she could make a formal introduction. Then, I should book a trip to New York to meet with those folks. My honest reaction to this suggestion was "I know I have to, but I kinda don't want to." I think I have this impression that the "New York elite" is very insular and tough to penetrate. It felt intimidating to begin knocking on doors for face time. So, while I went through with the steps and booked my flight, I would tell people with a bit of a shrug and a dismissive sneer, "I'm just going to New York to shmooze." When I actually met with these industry folks though, I was so pleasantly surprised. In addition to agents, I met with an artistic staff, an educational director, a theatre publisher, a book publisher, a playwright who is further along in her career, and a composer who is further along in his career (in addition to catching up with a whole slew of actor friends). All of these individuals (save for maybe one) turned out to be quite generous and kind. Sure, a few of them were very matter-of-fact, but I appreciated candor over beating around the bush. All of them also gave smart and welcome advice. None of them had to meet up with me, none of them had to give me any advice, none of them had to get to know me. But they chose to. I've come away from the week with a new perspective on "shmoozing." First - yes, it is hard to penetrate a bubble if you don't have a connection, but it only makes sense then to make the most of your existing connections. And for me, I had Amy Mueller and other folks who recommended people to meet up with, as well as people who I had already met previously and just needed to reach out to. People are busy, and they can't tell which cold e-mails or calls are from people who are worth their limited time. So a professional recommendation or introduction from a trusted colleague gets their antennae up. Second - theatre people are theatre people. There may be some jerks in the mix, but really we're all just wanting to contribute to the performing arts scene in whatever way we can. Most of us would rather make a genuine connection than "shmooze." In fact, I think I need to stop using that word entirely, because it has such a slimy, self-interested connotation. I was on a networking trip where I made many great connections in my field. I hope I never have to "shmooze" again. Posted on May 30, 2018 by Min Kahng and filed under Career, Musical Theater, Performing Arts, Thought and tagged New York agent Playwrights Foundation. 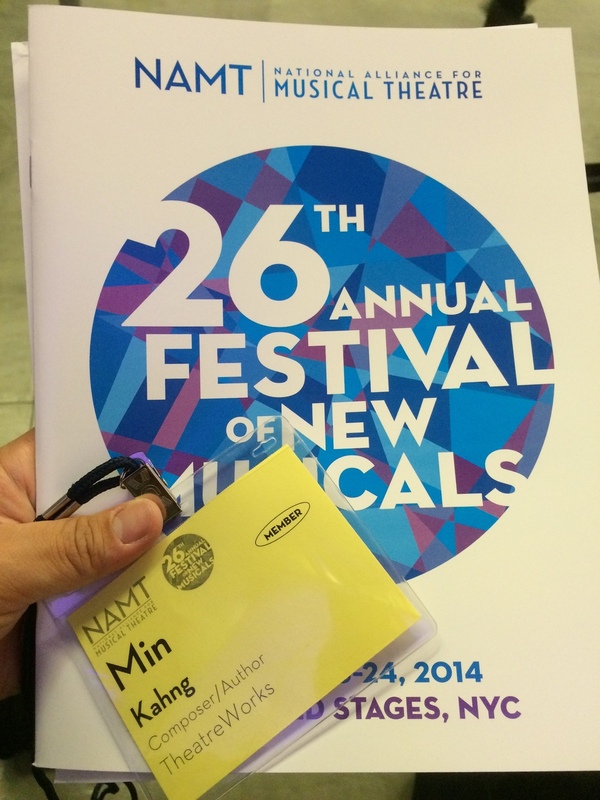 As part of my 2014 career map, I set a goal of attending a musical theatre festival in New York. Thanks to funds provided by Theatre Bay Area's Titan Award and the influence of my mentor, Leslie Martinson, I was able to tag along with TheatreWorks to NAMT’s Festival of New Musicals last week at New World Stages in NYC (Holy Hyperlinks!). My main objectives were to observe, learn and get a pulse on what is happening in the musical theatre industry. I was so excited to receive my packet and name badge!!! Here’s how the two-day festival worked. Eight writing teams, who were chosen prior to the festival, prepared 45-minute versions of their current projects for presentation on one of two stages. Festival attendees were assigned one of two show-tracks. On the first day, we waited in line to enter a theatre, watched one team present their 45-minute snippet, exited into the lobby where the writers handed out demos and made themselves available for conversation, then immediately queued up again to re-enter the theatre to watch the next presentation. This repeated until we saw four shows that day. The second day was nearly identical, except we watched the remaining four shows in the second theatre. There was also a special songwriting showcase on the first day, during which four writing teams were able to share two songs from their current projects. Basically, it was a full two days of musical theatre. I should say, NEW musical theatre. I won't go into too much detail (if you're curious about the line-up of shows, click here). I will say that there was such a refreshing breadth of musical theatre styles represented in the festival. Some were very contemporary and varied, while others stayed true to a particular culture or time-period. There were love stories and tragedies and hilarious comedies. And my God, the talent! From the writing to the musicians to the actors, it was clear to me that these were not mere dabblers in the art of musical theatre. These folks took what they were doing seriously and poured themselves into their projects. I think that’s what stood out to me most about the Festival of New Musicals. Everyone there loved musicals and wanted to catch a glimpse of where the art form is headed. Theatre companies were interested in finding a work they could invest in and help develop into a fully realized show. I was surrounded by people who loved musical theatre as much as I do. I come away from the festival with great, practical insight into what gets a show to its next steps. But perhaps more importantly, I come away feeling like my passion for musical theatre is not silly or ungrounded - it's a passion shared by others - and I am invigorated to jump right back into my own writing. Posted on November 4, 2014 by Min Kahng and filed under Career, Musical Theater, Performing Arts and tagged New York Festival of New Musicals NAMT TheatreWorksSV Titan Award Theatre Bay Area.